Wherein I no longer feel like I’m drowning. Under fabric I mean. My mom’s quilt is basted and ready for me to quilt. This is one big quilt. I think its the largest I’ve ever made. Its size, the large fabric pieces for the front and the back and my not wanting to do any quilt math meant that it took me way longer than it should have to bring the quilt to this point in its construction. (Could I have written a more awkward sentence just there?) I spent some time Saturday stitching the back together and Sunday was basting day. And here’s the new technique I tried. Thread basting the quilt sandwich. I didn’t set out to baste it this way, but I ran out of quilt safety pins. Not really having any other alternative, I looked at a few videos on YouTube. Armed with a needle and hand quilting thread, thicker than regular sewing thread, I crawled around my kitchen floor basting this sucker together. The stitch used is a herringbone stitch, a common basting stitch used in garment sewing. 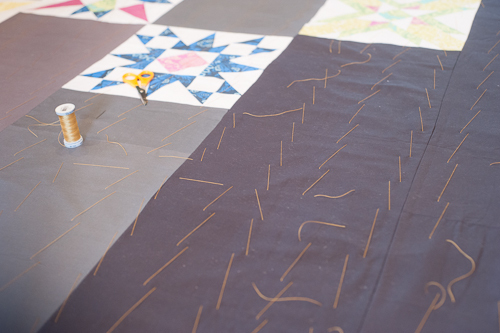 I wish I could tell you this was an easy method to baste a quilt, but it wasn’t. I was still crawling around on my hands and knees, bent over awkwardly for almost an hour. I can tell you that in my YouTube and Google search, I found an alternate method of sandwiching a large quilt. I’ll give it a try with my next one and let you know what I think.